Ho Chi Minh City in Vietnam has partnered with Rotterdam in the Netherlands to learn from each other’s experience and collaborate on a Climate Adaptation Strategy. Photo by BBC World Service/Flickr. Due to climate change, hundreds of millions of people in urban areas across the world will be exposed to rising sea levels, greater inland flooding, more frequent and intense storms, and regular periods of both extreme heat and cold in the coming years. Despite these risks, many cities have not yet addressed resilience—the capacity to not only bounce back after a natural disaster, but also strengthen protection to future hazards and learn from the experience. Cities often lack the technical and financial capacity to invest in resilience building. Particularly in developing countries, cities face a range of pressing challenges—from providing basic services, to ensuring affordable housing, developing sustainable transport, and increasing economic opportunity. Because of these immediate and pressing issues, city leaders often do not prioritize projects, like early warning systems, or policies, like zoning codes, that can build the long-term capacity of their communities to properly respond to climate hazards. Especially far down on the list of priorities are the governance-related changes necessary for ensuring that efforts are actually implemented and are effective. In order to overcome these challenges, it is essential that leaders develop repositories of context-specific information, share their information and insights, and coordinate among departments. Acting on these three enabling factors will ensure that cities worldwide achieve the level of resilience they require. It’s critical that city officials have accurate and full information about the potential impacts of various hazards in their city and how different areas of the city and various communities might be impacted differently. For example, a storm with significant storm surge will cause much more significant damage along the coastline but a storm with high wind speeds and low storm surge will affect different neighborhoods. This information needs to be collected and updated by each city itself; it is not the kind of information that can be shared across cities. After Hurricane Sandy in 2012, New York City became an exemplar for developing context-specific information. In 2013, Mayor Bloomberg updated PlanNYC to “A Stronger, More Resilient New York,” emphasizing urban resilience. The comprehensive plan has updated flood maps and other city-specific information, and contains actionable recommendations for protecting the city’s coastline, buildings, infrastructure, and communities from future climate risks. An important step towards building resilience is sharing this information and properly communicating it to the public. With accurate and timely hazard information, communities—especially vulnerable populations—can better respond to climate threats, particularly when supported with evacuation routes and emergency transport options. Furthermore, cities can learn a lot from one another, so sharing information about their experiences with successful policies and programs is invaluable. For example, Rotterdam and Ho Chi Minh City are topographically similar cities, and Rotterdam is helping city officials in Ho Chi Minh City create and implement a Climate Adaptation Strategy through the Connecting Delta Cities Network. This type of partnership is critical for developing not only financial resources, but technical capacity as well. Coordination is often already a significant challenge for city departments and sectors. However, proactively building climate resilience requires coordinating actions between many departments, and may even require new mechanisms for collaboration between both departments and civil society. Particularly when cities build resilience to climate change through projects in specific sectors, communication and coordination across sectors can maximize efficiency and economic savings. If stakeholders fail to communicate, efforts to build resilience may result in maladaptation. 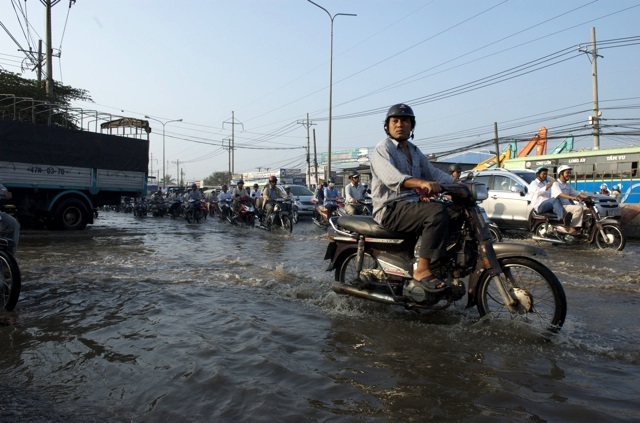 For instance, floods affecting Bangkok and the surrounding region in 2011 divided the city center from peri-urban populations because of the government’s decision to create floodwalls protecting the city. By not coordinating between jurisdictions outside the urban core, officials were unable to meet the pressing needs of the vulnerable populations north of the city that were badly affected by flooding. Around the world, cities are at different stages of resilience planning. Some have developed stand-alone resilience plans, some have integrated resilience into their master plans or urban development plans, and others are choosing to build resilience within a sector or through specific projects. Regardless of the strategy that decision makers adopt, the more context-specific information they have, the more they share information with citizens and other stakeholders, and the more coordination they foster, the more likely they will be to build resilience that is sustainable over time. Researchers, practitioners and city officials are gathering in Bonn this week (June 8-10, 2015) at the ICLEI Resilient Cities Congress to discuss how they can work together to facilitate climate resilience building in a more effective way than ever before. This is no small task, but cities around the world are beginning to act.